“Visual excellence is that which gives the viewer the greatest number of ideas in the shortest time with the least ink in the smallest space” – Edward Tufte. Often, it is easy to aggregate data and answer clients’ needs;however, creating a concise story from the visualizations and delivering suitable insights can be more difficult. Finding appropriate, effective, and simple visuals to best represent data is a challenging task that must be approached from multiple angles. In addition to incorporating user needs, it is imperative to apply best practice UI/UX to data visualization. In particular, to truly understand and respond to the user, we have to utilize heavily researched psychological factors within our dashboards. In this article, we address these challenges and help you create impactful visuals. We are in an ever-changing dialogue with data and we want to take you through the journey of combining these human tendencies with business intelligence and analytics to create a better finished product. Hedwig Von Restorff was a German psychiatrist that discovered an interesting phenomenon in her patients. When people are presented with various similar objects, lists, or pictures the one that differs from the rest is most likely to be remembered. This is the Von Restorff Effect. Figure 1: Visual detailing the ease at which we recognize the dissimilar. This is a common principle in user interfaces as it is crucial in how people interact with visuals. The effect is the outcome of human’s nature to see what stands out. Therefore, you need the Von Restorff Effect in visualizations to pander to that desire and make your data shine. Implementing the Von Restorff Effect in your data visualizations within business Intelligence is a quick guarantee to guide your readers’ eyes to where you want them to go. The simplest way to do this is with call-to-action buttons. When you want a user to click on something make it stand out – Bold. Italicize. Underline.These are ways to differentiate from the rest of the visual and will encourage the reader to click and interact and is a sure-fire way to help better deliver your message. This is how we can differentiate between simple static items and dynamic call-to-action initiatives. Von Restorff’s effect relates to the serial-position effect and conditional formatting. The serial-position effect is the ability of a user to best remember the first and last items in a series. 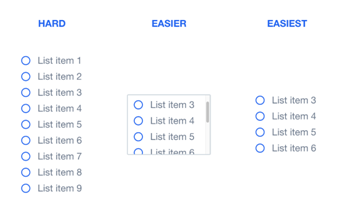 In dashboarding and business intelligence visualizations, it is crucial to conditionally format the important information near the beginning and at the end. Showing key performance indicators at the beginning draws the readers’ attention and causes them to remember these values. Implementing the Von Restorff Effect and the serial-position effect will allow your information to be more memorable, accessible, and readable. The Gestalt principle is another law for designing effective user interfaces. The Gestalt psychologists of the Berlin school of psychology developed gestaltism. Gestaltism is a psychology of the mind that developed the pinnacles of this law. This principle states that objects that are near, or proximate to each other, tend to be grouped together. Our brains can easily associate objects close to each other, better than it does with objects spaced far apart. This clustering trait occurs because humans have a natural tendency to organize and group. In the simplest sense, if I go to a restaurant and see a group of five people sitting at the same table, I immediately—without conscious thought— assume they are friends because of their proximity. This is an innate truth to our human behavior and can be a powerful addition to visualizing data. Implementing the law of proximity into your BI dashboards will help the readers take in your information with ease and natural intuition. Figure 2: Visual detailing the ease at which we associate the groups in the right visual, compared to the cluster of objects in the left. Grouping relevant data categories together in your visualizations will allow the readers to cluster the information and group the insights. This can help present powerful and interactive responses from your audience by delivering the necessary feedback from a given visual. The Gestalt Principle is one such law that can tie together what would be a convoluted dashboard and create concise, exact, summarized data visuals. The amount of time it takes to make a decision after being provided withchoices isanother crucial principle of gaining appropriate insights from your analytics visualizations. Hicks and Hyman studied behavior and decision making, and they discovered that the time it takes to make a decision increases logarithmically as the number of choices increases. Figure 3: Visual detailing the different ways to navigate selections. Clearly there is an easiest method. This law will be most important when dashboarding and visualizing your data. When creating dashboards that are actionable and have decision makers in the audience, we do not want to overload the dashboard with visuals. Instead, think of creating summary pages. These pages would be dedicated specifically to drill down to action, call-to-actions, and items that require decisions. This separation of decision and visuals will allow your readers to spend less time making choices and more time consuming the data insights. This also implores the principles of Gestalt by grouping similar entities. The decision-making law is yet another important principle that will take your visualizations from acceptable to remarkable. The F-Pattern is the study of how readers consume information. 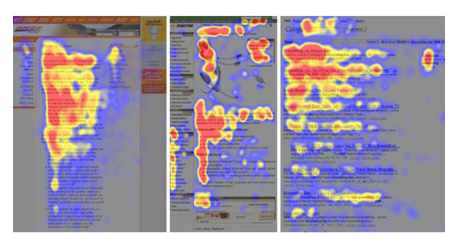 It is an eye-tracking study that determines how readers interacted with UI/UX. In 1997, Jakob Nielsen, a leading web usability expert discovered this pattern, noticing people generally read 25% slower on a computer screen in comparison to a printed page. The F-pattern represents where on the page a reader typically focuses, following the shape of the letter F. The two horizontal bars on the F are the top most important pieces of information. The vertical bar represents the reader tending to read the left side of the page and only the first few words. Figure 4: Visual detailing the eye-patterns of patients that scanned a website, creating the F-pattern. This pattern is another crucial addition to completing a great data visualization. Connecting this final principle to your business intelligence dashboard will take it to the next level for gaining efficient and optimal insights. The best content should be anchored across the top with left corner precedence. This spot is guaranteed to get noticed. Making sure to abide by the F-Pattern will assure your visuals make a lasting a meaningful impression with your audience. Proper use of the above for principles and appropriate utilization of shapes in an efficient manner will bring your business intelligence and analytics to the next level. “Our primary visual design objective will be to present content to readers in a manner that highlights what’s important, arranges it for clarity, and leads them through it in the sequence that tells the stories best.” – Stephen Few Using the principles in this article you will be able to present data in the best possible way to satisfy the needs of your audience. Most importantly, the value of dashboarding can be better realized from end-users as the process of obtaining insights then aligns with their natural human tendencies. Follow along with our team for a webinar detailing these dashboards soon!